Robot news: Doggie Robot Eases Loneliness In Nursing Home Residents As Well As Real Dog. A sophisticated robotic dog could be a good companion for your dog-loving grandmother who can't care for a living pet, a new Saint Louis University study suggests. 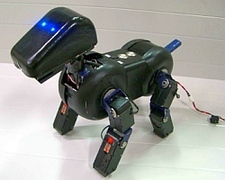 The researchers compared how residents of three nursing homes interacted with Sparky, a living, medium-sized gentle mutt, and Aibo, a doggie robot once manufactured by Sony that looks like a three-dimensional cartoon. "The most surprising thing is they worked almost equally well in terms of alleviating loneliness and causing residents to form attachments," says William A. Banks, M.D., professor of geriatric medicine at Saint Louis University. "For those people who can't have a living pet but who would like to have a pet, robotics could address the issue of companionship," Banks says. 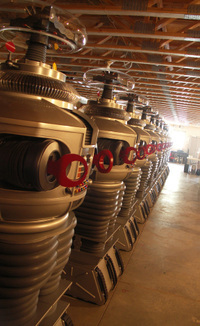 The robot stores up to six cans of beer in its refrigerated belly, then dispenses them into a glass mug when you’re ready for a drink. It's the perfect companion to your soccer watching session! Do you remember Will Robinson's best friend, dont you? These replicas include some cool features, like a 240 watt stereo sound system, 500 voice original voice tracks stored on internal Compact Flash memory, and iPod audio input. Robot B9 can be controlled via remote control keychain and when you remove his power pack and he says "Aaghhhhhh..." and shuts down, just like in the 1965 show. B9Creations will make 30 - 50 B9 replicas per year, and you can have your very own for $18,000 USD plus packing and shipping if you reserve yours now, or full retail price of $24,500 USD if you wait. Just when you thought it was safe to get into the water again here comes a 2' long robotic shark to scare you. The baby Jaws has a full-range of motion to replicate the smooth, sleek swimming of one of nature's most efficient predators. It is able to gracefully maneuver up, down, left, right, and even backwards through water, in depths up to 9'. The shark can swim up to 40' from its handheld remote unit which is also submersible, allowing you to swim with your shark. The unit has a 15-minute run time per charge. 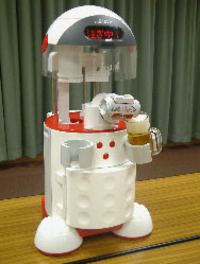 Beer and robots, how cool is that? I need to win one of these so my wife can get a break, lol. In reality in the old Downs household it goes something like this, hey honey get me another cold one, her response “Get it your damn self” Now I need to move to Japan at least until I can bring home one of these. 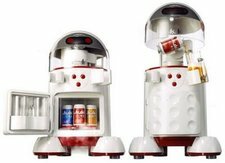 Asahi is running a promotion where they’ll be giving away 5,000 fully stocked refrigerator robots. What do these lovely creatures do?